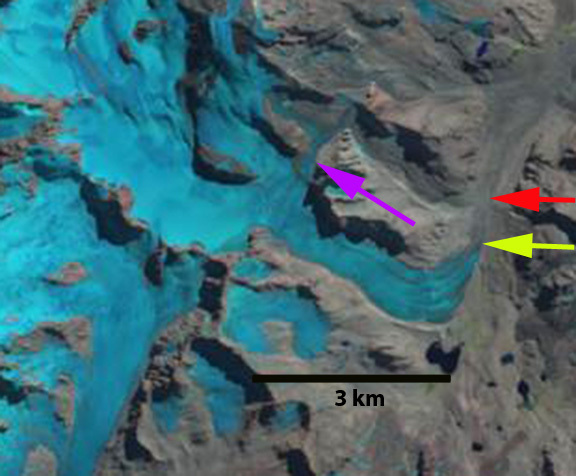 Cortaderal Glacier is in central Chile on the south slope of Paloma a stratovolcano. The glacier feeds the Cortaderal River which joins the Cachapoal River. 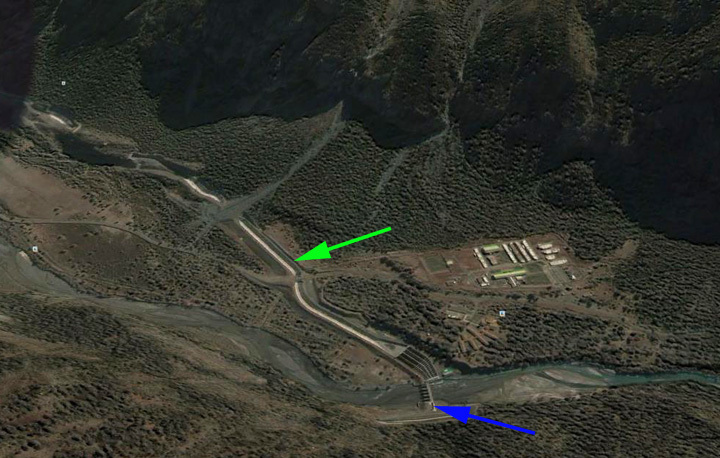 Pacific Hydro has opened a new hydropower plant at Chacayes that is fed by this and other glaciers. It is a 111 MW run of river project with water taken out at a small dam run through a canal a small reservoir and back into the river. 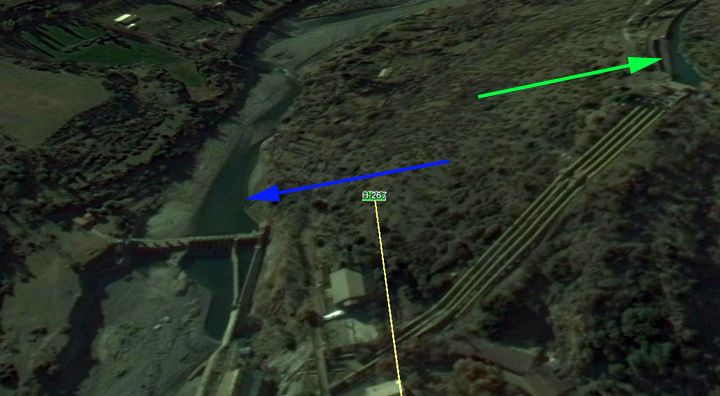 There is an older Coya Hydropower Plant a short distance downstream. Pacific Hydro plans to add several more plants in the area. 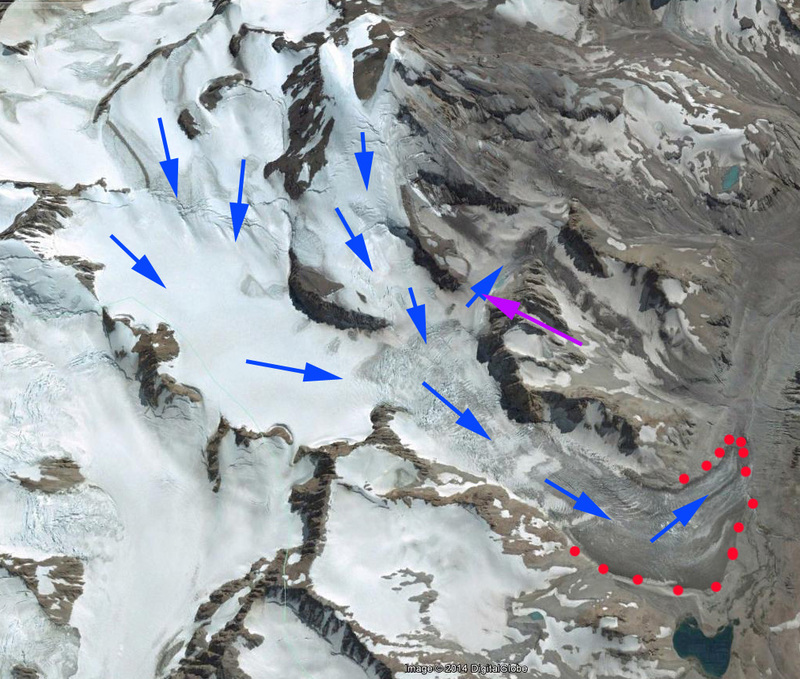 Continued glacier retreat in the regions will lead to further glacier runoff declines during the melt season. 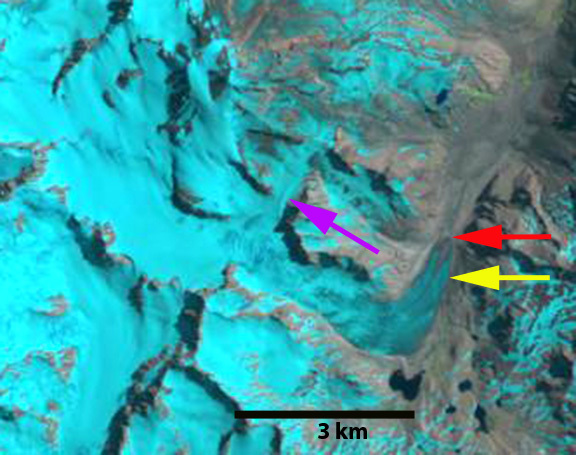 La Quesne et al (2009) reported a that Cortaderal Glacier retreated 110 m from 1970-2000 and 450 m from 2000-2007. Here we use satellite imagery from 1990-2014 to observe this retreat and more recent changes. 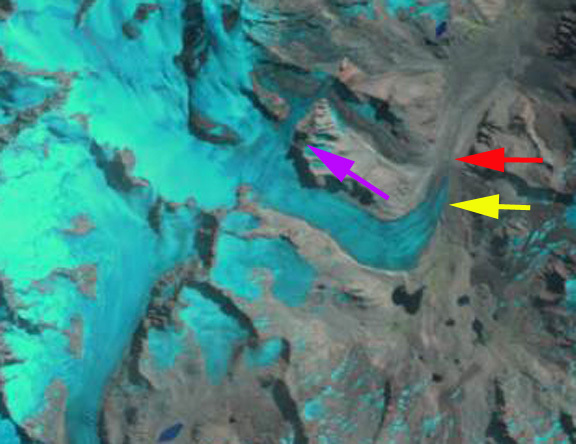 In each image the red arrow is the 1990 terminus the 2014 is marked by a yellow arrow and the purple arrow a smaller side glacier feeding a secondary terminus. In 1990 the glacier after descending turned north in the main river valley and extended 1 km north. 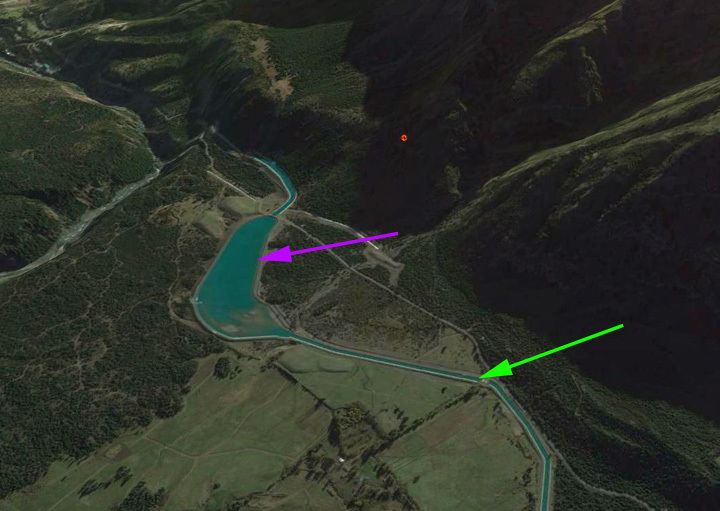 The side glacier has a significant width of 300 m. By 2000 the glacier had retreated 300 m and with a high snowline the connection to the secondary terminus at the purple arrow is narrowing but still significant. In 2003 further change is hard to discern. In 2013 substantial further retreat has occurred, the snowline is high at 3800 m and the secondary terminus connection is nearly gone. 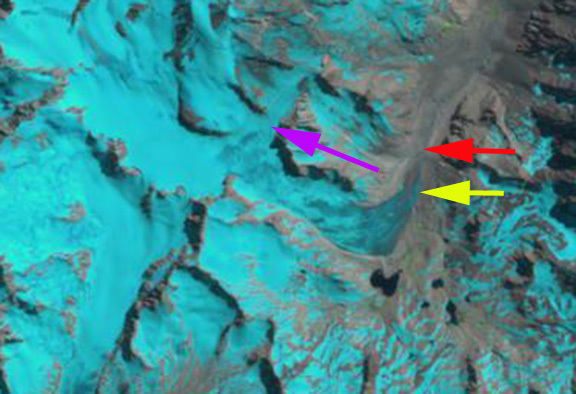 By 2014 the retreat since 1990 is 800 to 900 m, the snowline is at 3700 m and the secondary terminus connection is to narrow to actually feed glacier ice. The retreat here is similar to that of nearby Glaciar del Humo, Argentina. 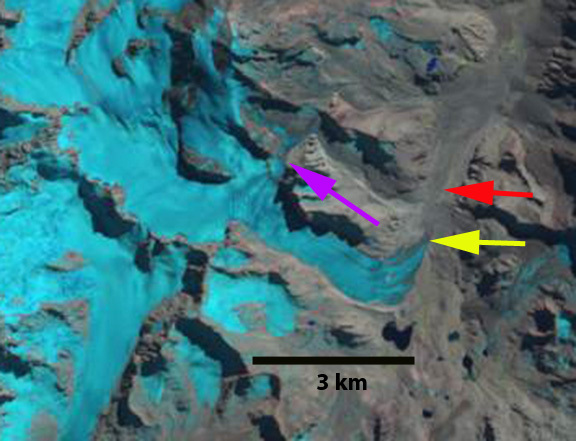 The Laboratorio de Glaciologia in Valdivia, Chile, Rivera et al (2002), has noted the extensive retreat of the Central Chile glaciers over the last four decades. This entry was posted in chile glacier melt, chile glacier retreat, Chile glaciers and hydropower, Cortaderal glacier retreat. Bookmark the permalink.